What Grasses Grow in Shade? 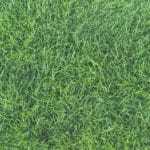 When you are choosing grass for your lawn, it’s important to choose the right variety. Some grasses grow in shade while others thrive in sun. Choose the wrong one, and you’ve got a lawn that doesn’t thrive. 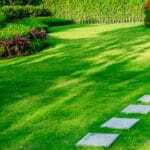 For example, the most common yard grasses like Kentucky bluegrass or perennial ryegrass are not shade lovers and you’d end up with a lawn that lacks luster. 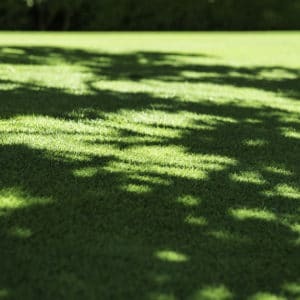 And often times, your lawn isn’t all-shade or all-sun; there might be particularly shade spots near a tree line. Luckily, you have options for the shady spots. Grasses from the fescue family grow the best in shade. Fescue seeds are generally included in standard grass seed blends, making up about 1/3 of the mix. The healthiest grass tends to shine through these mixes, so if you have a partially shady lawn, the blend might work for you as the other grasses don’t get as much sunlight as they need. 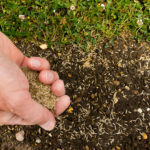 However, a blend won’t work for a very shady lawn or patch of yard, so you might need a custom mix. The biggest concern about these shady blends? They can cost a lot of money. 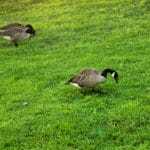 Plus, there are some other things to consider when debating whether or not the expensive grass will thrive, like if it will have to compete for nutrients with trees. Then you might have a pricy lawn grass that doesn’t even look healthy! If you’re doubtful it’s the right choice for your yard, consider mulching the area around the trees or planting a garden bed with shade-loving flowers. Does Your Grass Thrive in Shade or Sun? Green Lawn Fertilizing Knows. The grass you choose will determine whether or not you will have the pristine green lawn you’ve always wanted. Green Lawn Fertilizing knows just how to make your lawn thrive. Call us today at 888-581-5296 for a free quote.